Primitive Fall Autumn Halloween Candy Corn Bowl Fillers Set of 3. Perfect accent for your Fall arrangements. 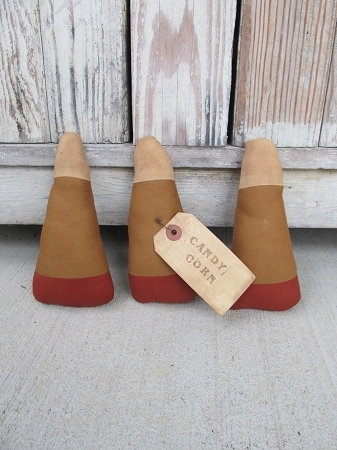 When I see candy corns, it always reminds me of Fall. Can't wait to buy a bag from the store and eat them!!! Set of 3 fabric candy corn bowl fillers, add these to her pumpkin bowl fillers or leaves for a fun Fall display. Size of each is 6 3/4" x 3 1/4". Also included is a primitive tag that reads Candy Corn pinned on by a rusty safety pin. Adorable! Hand made by Lynn.